The Spectropen, a hand-held device developed by Emory and Georgia Tech scientists, was designed to help surgeons see the margins of tumors during surgery. Some of the first results from procedures undertaken with the aid of the Spectropen in human cancer patients were recently published by the journal PLOS One.Â A related paper discussing image-guided removal of pulmonary nodules was just published in Annals of Thoracic Surgery. To test the Spectropen, biomedical engineer Shuming Nie and his colleagues have been collaborating with thoracic surgeon Sunil Singhal at the University of Pennsylvania. As described in the PLOS One paper, five patients with cancer in their lungs or chest participated in a pilot study at Penn. They received an injection of the fluorescent dye indocyanine green (ICG) before surgery. ICG is already FDA-approved for in vivo diagnostics and now used to assess cardiac and liver function. ICG accumulates in tumors more than normal tissue because tumors have leaky blood vessels and membranes. The Spectropen shines light close to the infrared range on the tumor, causing it to glow because of the fluorescent dye. In four of the patients, the surgeon could easily tell tumor from non-tumor by sight and by feel. In a fifth patient, however, though a CT and PET scan indicated that the tumor was a solitary mass, NIR imaging revealed glowing areas in what were thought to be healthy parts of the lung. At Emory, surgeons David Kooby and James Provenzale have been testing the Spectropen in a clinical trial led by Provenzale. Kooby is director of surgical oncology at Emory-Saint Joseph’s. 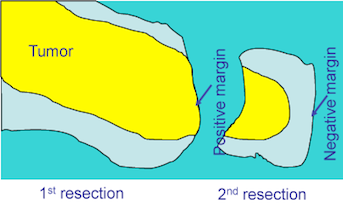 Nie reports that during a recent surgery for pancreatic cancer, his colleague Jian Xu, Kooby and Provenzale made a similar detection of additional tumor tissue beyond the surgeonsâ€™ initial estimate. This guided the surgeons to perform a second resection, making tumor removal more complete. Diagram at right; photo available upon request. One limitation of the technique, which is described in the PLOS One paper, is that ICG also absorbs into inflamed tissue. In some patients that had inflammation around their tumors, it was difficult to distinguish cancer from inflamed tissue. Nie says that is a potential solution would be to use a fluorescent dye conjugated to a small peptide or other chemical, such as folic acid, which more specifically binds cancer cells. Conjugating larger proteins, such as antibodies, to the dye makes it diffuse too slowly for imaging applications. â€œIt has to get there fast and clear out fast,â€ he says. The Spectropen is being developed as a commercial product by the Atlanta-based spinoff company Spectropath.